I’ve decided to pop some previews in with this “new listing” news from the shop. So from now on, there will be a mixture of patterns you can buy right now, and those you can enjoy here for the moment – but just ask for one and WZ will process them into PDF form for you “PDQ” (pretty darn quick – within 24hours). Normal shop listings are still with you much quicker; usually well within an hour or two – and not normally longer then 8hours (if we are asleep – or on an occasional safari!). So that is the plan – here is the first batch – if you are interested in any of them, just click here to email WonkyZebra ; to send Wonky an email. Either way this is a gorgeous sensual exploration of cable technique – wrapped around into a super sixties style mini. Cosy for winter daytime – in the office or out and about- and super comfy. 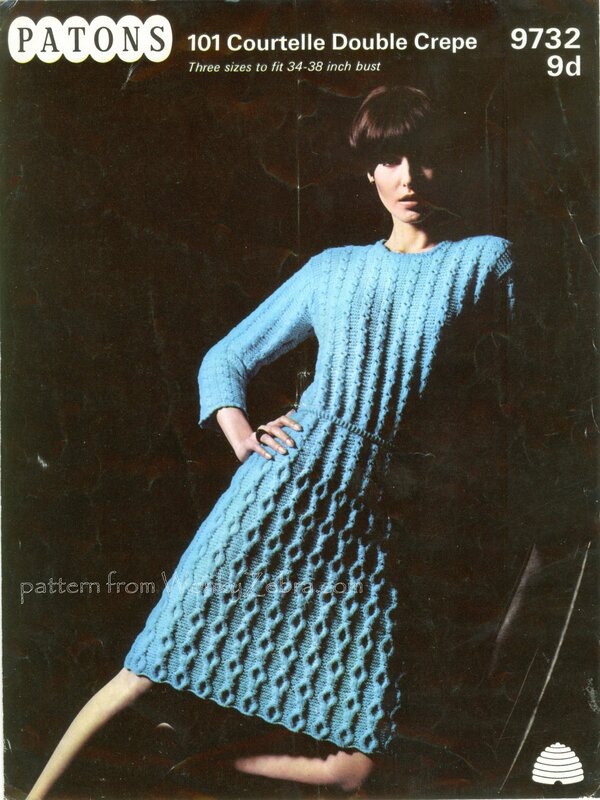 Another mid sixties knit dress; inspired by Courèges or maybe Cardin’s space age collection. Zip front-patch pockets… an almost utilitarian “overall” look, just saved by some sneaky design touches (and of course the colour!). Zoom in to see the waist dart shaping and the fact that the banding is on the bottom of an outside pocket flap – not the top edge. Plus of course that jaunty sixties hat with a signature stalk on top! Just the thing to brighten up a working week – in cosy comfort – as long as you remember not to bend over! It would work well over trousers (pants). An absolutely adorable, sweet as sugar, little knitted dress. It is made with a pretty lace stitch, in a vertical pattern of eyelet diagonals; the bust is made with an unusual twisted section of wide ribbed knitting. It looks like an angora but the original yarn was Patons kismet, an acrylic mohair mix. This was an unusual texture – not really as “hairy” as mohair, with an almost silky feel and drape. I have included a photo in the yarn notes I send with all the patterns so you can get a good substitute. Great for summer in pastel colours, or in a cotton mix or bamboo yarn-fabulous! Or lovely for anytime parties (especially in black). This little shirtwaister dress is a good choice if you don’t like too much fussy crochet – but want a cool look for summer. Almost an “Aertex”, or “Fred Perry” polo shirt, sporty look – with simple pattern bands alternating to give interest to the simple shape; and a front opening and collar detail . It is knee length –if you prefer mini dresses you need to decide early on as it is made hem up. I made this dress exactly as it is here – seduced by actually finding the pingouin wool in a (quite) local woolshop! A lovely simple shape to show off the heavy lace stitch pattern and metallic “Goldfingering” yarn (which is still available). This could go either way – elegant retro sixties evening dress – or sassy sixties disco dress. Good choice for Gemini’s – or just girls who base clothing choices on mood . 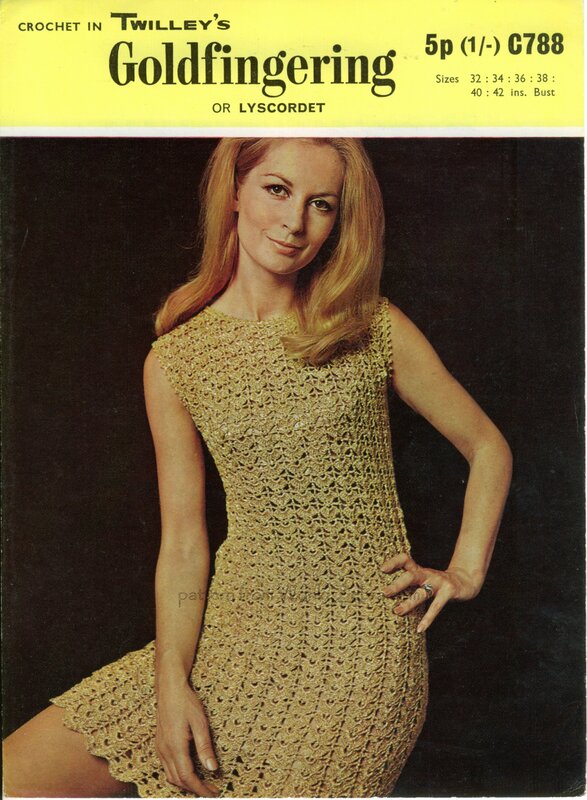 So to finish – back to one of my favourite late sixties shapes; these flippy skirted, high waisted, little dresses usually with a scooped neckline but here with a open v neck. 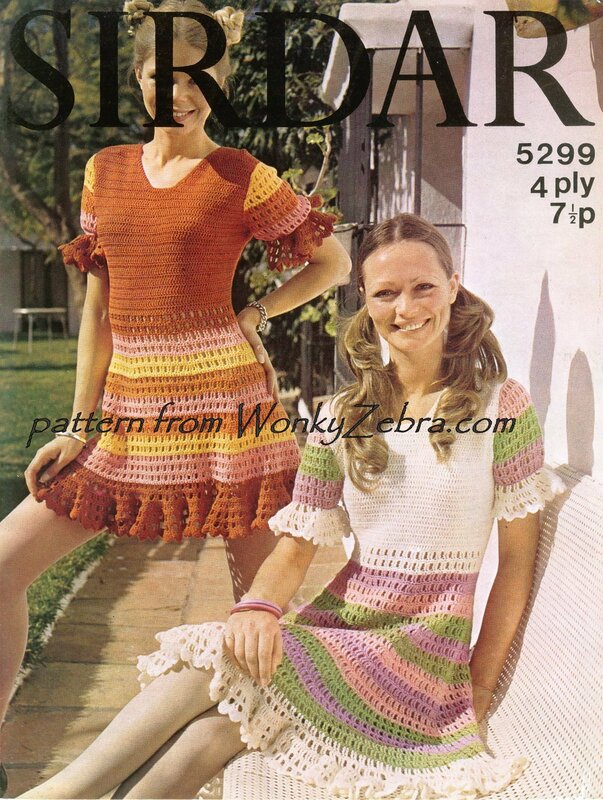 These two are both from Sirdar – along with a very similar one already listed; WZ 296. They vary in detail – and trim -the rose ruffle is interesting – a bit less of it might be better! Both sleeves work very well – it just depends on your preference. In fact, because they are so similar; anyone coming from this blog to buy WZ296 can get one of the other two free, by asking for P07 or P08 .. 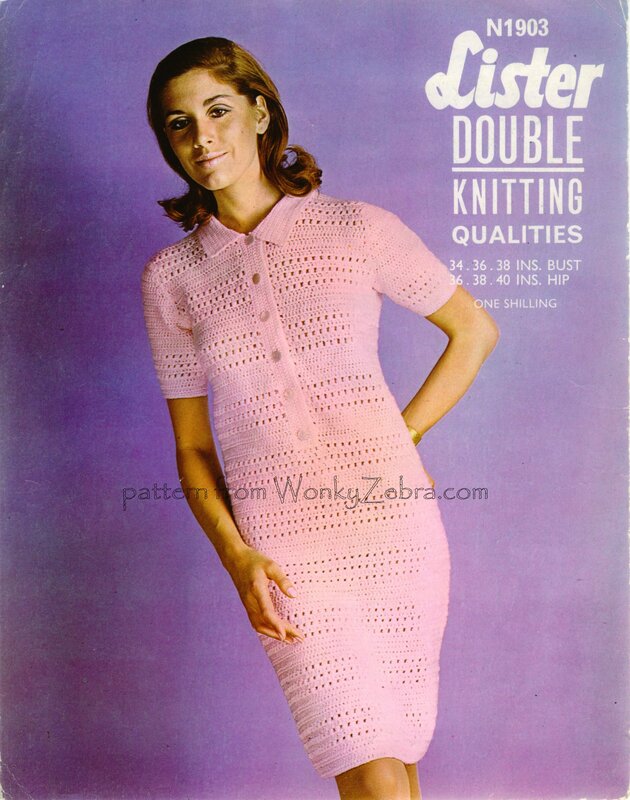 This entry was posted in WonkyZebra Patterns and tagged $2, $3, 5291, 5297, 6904, 9732, 9844, C788, cable knit, crochet, crochet mesh, dress, email, emailed, Etsy, Folksy, free, freebie, jaunty, kismet, knit, knit dress, knitted, knitted dress, knitting, mesh, mini, mini dress, N1903, Patons, pattern, patterns, pdf, pdfs, pingouin, polo, preview, retro, ruffle, seventies, sheath, shell, shop, sirdar, sixties, sleeveless, slinky, vintage, vtg, wonky, wonkyzebra, wool, wz, yarn, zebra, Zibbet. Bookmark the permalink.